Several days ago I found myself standing (a bit reluctantly) on the peak of the roof of the Methodist Church. A spindly aluminum extension ladder led to the edge of the roof, and a second ladder was propped up on the first, leading all the way to the ridge and the belfry. Woody Billings had graciously offered (OK, he was cajoled by the preacher, Joyce Reynolds) to repair the mechanism that allows one to toll the bell by pulling on a rope in the vestibule. After removing the louvers in the belfry to gain access to the bell Woody discovered that the rope is wound around a 3-foot hand-made wooden wheel attached to an axle that turns the bell. On the wheel is a metal plate engraved with the words, "Made by Lawton Howard, 1979." Woody wanted to be sure I saw this normally hidden example of my dad's craftsmanship. And so it was that I was standing on the peak of the church roof on a sunny August morning. Had the upper ladder on which I was standing actually been secured to something more stable I might have been inclined to stay a while longer and enjoy the view. But I was happy to climb back down. Woody took some photos of the bell and the wheel. Maybe he'll email one to me so I can publish it. The large canvas rain tent was set up at the Community Center yesterday evening. By the time David & I arrived (about 6:30) the road was choked with vehicles and the grounds were bustling with Ocracoke residents. The island's sizeable Mexican community was hosting a fund raiser for the Ocracoke Day Care. Tables were set up and piled high with flour tortillas, refried beans, hot sauces, guacamole, lettuce, tomatoes, and sour cream. The mood was festive, the smiles contagious, and the food delicious. 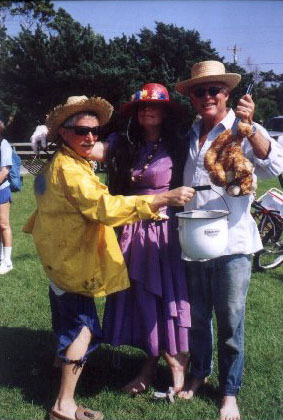 I don't know how much money was raised, but it had to be a tidy sum. Everyone, it seemed, was there, and all were contributing to a wonderful local cause. One of Ocracoke's brightest schoolteachers stopped by the house at lunchtime yesterday. Charles Temple had spent the summer at Oxford studying British poetry. Amy, David, and Lachlan were with me on the back porch enjoying a leisurely midday meal when Charles walked in. It was so good to see him again. He was full of excitement and enthusiasm, and entertained us with a few stories about the campus, the hordes of U.S. and Italian summer students in London, and why he hadn't acquired a British accent. He graciously accepted a sloppy joe sandwich, cheese doodles, and a soft drink. I remarked that he showed no signs of being insufferable, but he assured me that I might want to reserve judgment. At any rate it's good to have Charles back on the island. Last evening and this morning have been simply gorgeous. Temperatures dropped a bit, and a light breeze has been caressing the island. Skies are clear and the opressive heat has lifted. We all know that summer temperatures are sure to return, but islanders are reveling in this end-of-summer taste of cooler weather, and looking forward to a glorious fall. I awoke early this morning to the light patter of rain on the roof. Outside, in the half-light, freshly formed droplets were hanging for a moment on the leaves & branches before falling gracefully to the ground below. All was quiet and calm. Gradually, very gradually, the yaupons, cedars, and live oaks emerged from the darkness in verdant profusion. It was the perfect morning to eat a leisurely breakfast while listening to gentle tunes by John Golden, especially "The Last Farewell" & "Roseanna." Imagine my surprise yesterday evening as I was sitting on my porch swing about 9 o'clock. A large white draft horse ambled by pulling a white carriage. I waved to the drivers and they stopped to chat for a few minutes. They are here on vacation (I guess they just decided to bring along their draft horse and carriage like other folks pack sun screen and beach umbrellas!). They've decided to offer rides around the village this week. Sounds like they might return next season, too -- maybe for the entire summer. That's the water temperature! According to Dale, who keeps track of such things, the water this summer is sometimes warmer than the air. Amy, Lachlan, and I spent part of yesterday morning at the beach. The ocean floor dropped off close to shore and the water was up to my chest in just a few paces. The waves were a rich aqua green and medium sized (with little current) and fun to play in. Not the best for a one year old, to be sure, but Amy & I took turns playing with Lachlan in the small waves right on the edge of the beach. He had a grand time, laughing and splashing and licking salt from his lips. No one got chilly today! Another historical note: Today is the anniversary of one of two major hurricanes that struck in 1933. Water was knee deep between the village and the beach. Boats were sunk, fish houses washed out to sea, and porches of houses blown away. Captain Bill Gaskill's Pamlico Inn was badly damaged and the dance hall at the end of his dock was swept away (the Inn and docks were repaired, only to be damaged beyond repair in the September hurricane of 1944). It's for more than just picking up your mail. You can get things done there -- if you just happen to run into the right person. Maybe you need to borrow a 3/4" drill. Who knows....Jason might be in the lobby and you can ask him. Or maybe a friend's daughter is hoping to move to the island next summer...and that neighbor with a spare room just walked in to check her mail. It's a good idea to check the bulletin board while you're there. You can read about building permits that have been applied for, copy down an email address if you want to voice your concern about off-shore oil drilling, or check to see if anyone has found your lost bike. Need a ride to Norfolk? Want to share news about politicians in Swan Quarter? Have a boat for sale? Post it at the Post Office. Birth announcements, wedding invitations, addresses of folks in the hospital in Elizabeth City --- all this and more is to be found on the Post Office bulletin board. And an historical note: On this date in 1840 the Outer Banks got it's first Post Office, on Ocracoke. The postmaster was William Hatton Howard. August 20, 1887 was a "fearful" stormy day. According to James Howard, keeper of the Life Saving Station at Hatteras Inlet the sea was "full" and running over the beach. He reported that he could barely see due to the driving rain. At 2 pm, after the tide had dropped off he patrolled the beach and discovered two schooners, both with their main masts gone, beached on the sound side. The storm was so intense that Captain Jim's rescue boat was driven up on the shore and he lost both oars and his rudder. It wasn't until early morning of the next day that he was able to reach the "Cherubim" and the "A.J. Marine." Both vessels were eventually refloated with no lives lost. "Looks like you need something to relieve your stress and tension," a neighbor hollered out facetiously as he passed by in front of my house last night. I was lying on my porch swing, bare feet propped up on the chain, absorbed in an article in the New Yorker. The sun had set and the bright moonlight was casting surreal shadows across the drive. It took me a moment to respond. "Maybe I should take a vacation to a remote island and get away from this rat race," was all I could manage to say before he disappeared down the lane. Ocrafolk Opry star and outstanding island raconteur, Roy Parsons, celebrated his 84th birthday yesterday at the Wednesday night performance at Deepwater Theater. Roy played his guitar and mouth harp, and yodeled to a packed house. He also told tales of World War II & the Ghost Ship of the Outer Banks (did the cat really sail that schooner?). After the show Rosemary Garrish treated Roy and the rest of the performers with a decorated sheet cake, butterscotch brownies, and everyone's favorite, Ocracoke Island fig cake. We wish Roy a very Happy Birthday, and, of course, many more! Ocracokers love to pick on each other. It's good-natured, of course, but humorous stories about locals live on for years, even many years after folks are gone. Dale told me the following story just the other day. It seems an old time O'cocker went down to one of the local stores. He walked up to the counter and told the clerk what he'd come in for. "I'd like a cartoon of cigarettes," he said, "and a pound of babalony." One sign of a small community, and especially of a close-knit small community is residents' ability to laugh at themselves. This is just one of many pithy stories that O'cockers continue to tell. I suppose it's a good sign that our community is still intact. Hello folks this is Dale. Philip decided to let me write today's journal entry about the hurricane of 1899. I am the Cooperative Weather Observer for the National Weather Service here at Ocracoke, so he thought it would be appropriate for me to do the entry today. One of the worst hurricanes ever to strike the island occurred on today's date (August 16), 1899. Known by most folks as the San Ciriaco hurricane, Ocracokers call it The Old August Storm. The 1899 weather observer at the Weather Bureau Office in Hatteras gives this account of the hurricane. "The wind began blowing a gale on the morning of the 16th varying in velocity from 35 to 50 mph. On the early morning of the 17th the wind increased to a hurricane and at 4 am it was blowing at the rate of 70 mph. At 10 am it had increased to 84 mph and at 1 pm it was blowing a velocity of 93mph with occasional extreme velocities of 120 to 140 mph. The wind blew with even greater force from 3 pm to 7 pm. It is believed that between these hours the wind reached a regular velocity of at least 100 mph. At about 7:30 pm on the 17th there was a very decided lull in the force of the wind and at 8 pm it had fallen out until only a gentle breeze was blowing. The lull did not last more than a half hour, before the wind veered to the east and then south-east and began blowing at a velocity estimated to be 60 to 70 mph which continued until the morning of the 18th. During the morning of the 18th the wind veered to the south and continued to blow a gale, with heavy rain squalls all day, decreasing somewhat in the late evening and then going south-west. This day may be said to be the end of the hurricane, although the weather continued squally on the 19th, but without any winds of very high velocity". In Philip's next newsletter he will give a more detailed accounting of the hurricane and the experiences of the Ocracoke people. That's how long it takes me to get to work. Well, the commute itself isn't so bad, just a short walk around the corner. About a minute, maybe a little longer if my neighbors are sitting on their porch and I stop to say good morning. By the time I wash the breakfast dishes, make my bed, water the plants, and take my shower it's time to stroll over to Village Craftsmen. No hurry, no mad rush, no half-eaten breakfast roll. Island life suits me just fine. It really is refreshing, of course. I waited until late in the afternoon today to take my walk on the beach. After a half hour I jumped into the waves and found a chest-deep hole to swim and relax in. Curiously, after about ten minutes my foot stumbled on a patch of cool sand on the ocean floor. I dove under and felt around with my hands, but found nothing unusual. I wondered -- could it be seepage from the underground aquifer that supplies the village with our drinking water? I've heard that the Castle Hane Aquifer empties into the Atlantic somewhere near the campground, but I really don't know. Maybe one of our readers has more information. Regardless, my afternoon swim was so wonderful I hardly wanted to get out of the water. Sunny, clear, and temperatures in the 80's. It's just almost perfect weather today. I didn't make it to the beach this morning, but I've heard the waves are big again. I'm guessing this might be the effect of tropical depression Irene. The latest reports continue to predict a significant turn to the northeast, so we're looking towards continued great weather with virtually no additional impact from this storm. The surf yesterday was big...with lots of white water and some current. It was great for body surfing and boogie boarding. The water today was not so rough. I even found a chest deep pool between the beach and the breakers that was just perfect for swimming. Even better -- no one was anywhere nearby. I had the beach to myself. After my swim I walked a couple of miles down the beach, then lay in the sun and read a while. Not long enough to risk a sunburn, but enough to thoroughly relax. After one more quick dip in the ocean it was back home for lunch and to work this afternoon. A glance at the weather web site indicates more great beach days ahead. It looks like "Irene" will be staying well out to sea. We're all happy about that! Several weeks ago Lou Ann and I made an excursion to Hatteras. We stopped at the Graveyard of the Atlantic Museum which is still under construction but open to the public. Just inside the main entrance is the Cape Hatteras lighthouse's original 1st order Fresnel lens. It is quite impressive. In the late 1800's my great-grandfather, James Howard, was keeper of the Hatteras Inlet Life Saving Station. (Although it washed away in the mid 1950's, you can still see the pilings out in the ocean on the north end of Ocracoke.) Thanks to Bill Marsh of Suffolk, Virginia I have Captain Jim's original shipwreck reports which I carried with me to show to the museum's director, Joe Schwarzer. Together we perused the reports and toured the museum, including sections not yet completed. We had an opportunity to see a number of artifacts, including the large metal capstan from the Carroll A. Deering, the Ghost Ship of the Outer Banks, which wrecked in 1921. I had always heard that more than 500 ships met their end off the coast of North Carolina. I was surprised to learn that the number is more than three times that figure. It is sobering to remember the tragedies, the lives lost, and the bravery and heroism of the surfmen and keepers of the Outer Banks Life Saving Stations. If you have an opportunity to visit the museum, walk in and take a look around. The building is still under construction, but admission is free. At completion this will be a state of the art museum, a must-stop for anyone curious about shipwrecks and the many dramatic rescues along the Outer Banks. Weeks ago I promised phtotos of our winning July 4th float. These were recently sent to me by long-time friend Janet Sigler. Dave Frum is driving the truck. David Tweedie is providing fiddle music on the tailgate. 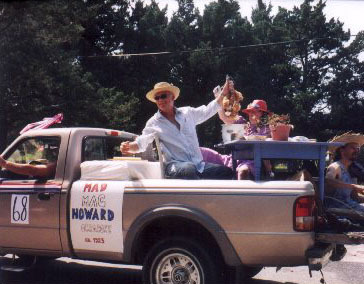 Jim Fineman from Manteo (in the yellow slicker in the second photo) was passing out information about Mad Mag Howard. Mag is played by Lou Ann in the purple dress. She, Mad Mag that is, is locally famous for a number of odd behaviors, not the least of which was cooking one of the island cats for her husband's dinner! I am portraying Mag's husband, John Sime Howard, pulling the cat out of the pot. We had a great time, and you may remember that we won 2nd place. Some day I'll publish the entire story of Mag. Til then, enjoy the photos. Visitors to Ocracoke come to the island to swim in the ocean, ride bikes in the village, fish a bit, and just relax. They sometimes imagine that those of us who live here are on a twelve month vacation. They see us sitting on our porches, walking along the beach, and working barefooted. We enjoy a delightful lifestyle to be sure, but no, we are not on an extended holiday. However we do take days off, even in the busy summer months. Yesterday I slept a bit later than usual, then rode out to the Pony Pen beach. The water was warm and rougher than nornal, but I didn't notice any strong currents. I swam and floated and dove under the waves. The sky was the bluest blue with cotton candy clouds on the eastern horizon. A few rain clouds hovered over the ocean to the south and over the sound to the west. I walked several miles soaking in the warm August sun. After lunch I read a while and took a short nap. By 3:30 I was ready to discharge my duty as babysitter. Lachlan and I went visiting. Our first stop was to see Muzel Bryant. She is 101 years old and sharp as an island sand spur. After visiting several other folks we played in the parlor, had our supper, and fell asleep in the hammock. For those of you who have been following the progress of the rehabilitation of my grandparents' house, I thought you might enjoy seeing a photo that was taken just a few days ago, after my neighbor, Matt Brown, finished the exterior painting. The house has been restored to its original colors -- white with brick red trim. As an Ocracoke resident said some years ago, "It's as cute as a bug's ear." Saturday was such a long, exhausting day (thus no journal entry yesterday). I drove Lou Ann to the airport. No one wanted to see her leave. We awoke at 4:30 and caught the 6:00 am ferry to Hatteras. Then "up the beach" and to Norfolk. We were caught up in a vast ingress and egress. Vacationers in cars and pickup trucks and SUVs pulling boats, their roofs laden with surfboards, kayaks, and bicycles. The vehicles were crammed with strollers, coolers, suitcases, food, and excited children peering out the rear windows. We arrived at the airport in time to share one more lunch. So many times this summer we enjoyed our meals together -- in the kitchen, at a local restaurant, on our back screened porch, or sitting side by side on the swing on the front pizer. Needless to say, I hated to see Lou Ann leave, and she shed more than a few tears. We consoled ourselves with plans for visits in September, October, Thanksgiving, and Christmas. Back home the house was still and quiet. But Lou Ann will be back. She left her antique bed quilt, her red teapot, her bubblegum toothpaste on the bathroom shelf....all reminders of a wonderful, magical Ocracoke summer. I miss her. I do love early morning...watching the sky turn from the deepest shade of ebony darkness to the aurora of day. Yesterday morning was just one of those splendid mornings. Nina (from the Lightkeeper's House and kayak guide) took three of us out on an early morning kayak tour into the Sound. I balanced my early morning coffee on the handle bars of my bike into the dark village. Grey dawn greeted us as we pushed off the shore. As the sun poured over the horizon, we were pushing towards Teach's Hole and the marshy inlets. We were not disappointed. Quiet, hushed silence was our conversation as we watched egrets and herons and kingfishers. By the time we returned, the sun was high and the village was bustling with the morning. It was a wonderful way to end my summer adventure. I will be leaving for Indiana in the morning. I arrived on June 1st, and these golden days of summer have fled by. My mind is etched with memories..snapshots in thoughts and sights and sounds. Thank you for letting me share my summer with you...for visiting at the Village Craftsmen. Until we meet again, I wish you sand in your sneakers, sunrises on quiet oceans, and a summer's worth of stories to remember. It's that time again. We've published another monthly newsletter. This month I share the story of the old toothbrush man who traveled to Ocracoke years ago. The story was told to me by my cousin Blanche. I am recording as many of these old tales as possible before they are lost. To read the story just click on the link below. I hope you enjoy it. Today is Philip's Birthday! (That is one of the reasons I am writing the blog; he probably wouldn't tell you!) He shares his birthday with his sweet Grandson, Lachlan, who turns one on this day. After much feasting and conversation, we all gathered in the parlor for music provided by David, Marcy, and Lou. They brought out their madolins, guitars, and fiddles. We all clapped and cheered during "Paddy's Holler." A hush fell over captive friends and family as David began singing "Howard Street." As I looked around the parlor, I could see couples sitting closer, children grew quiet....time was suspended for a short time. A few folks stayed late into the evening as we moved the furniture to one side of the back porch and decided to have a square dance. Philip called the dance...the musicians played and we all danced and laughed, barefoot, of course. Friends. Family. Pot Luck Supper. Birhdays. Music. Dancing. Fig Cake. Laughter. * A comment from Philip: July 22 was Lou Ann's birthday, so this was a party for her also.